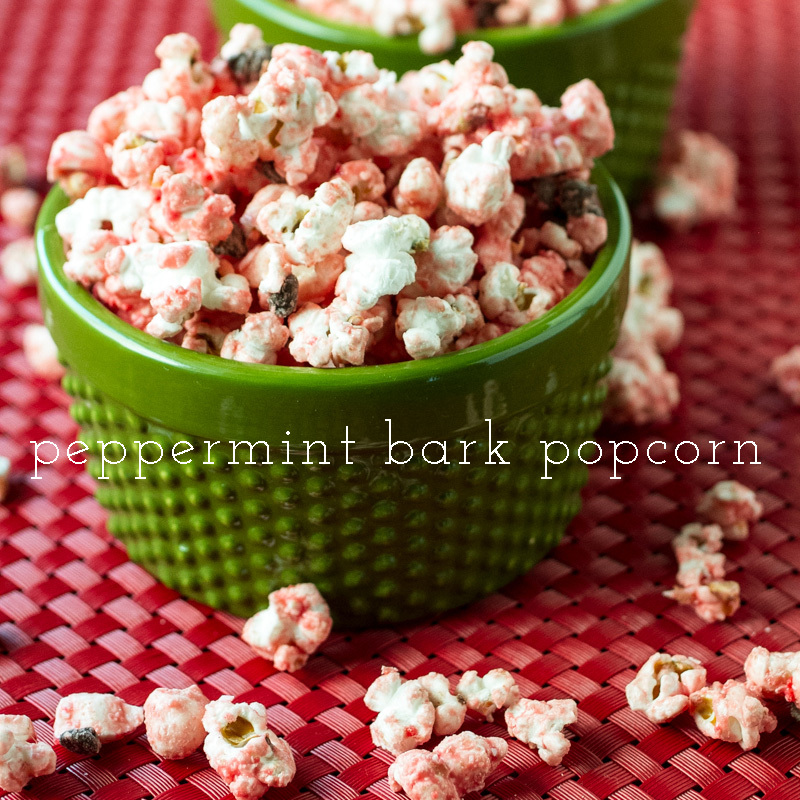 Peppermint bark popcorn combines some of my favorite things: peppermint bark (well, pretty much anything mint-flavored, really) and popcorn. I would happily eat popcorn as a snack every. single. day. And if a mint dessert is available I will choose it over all other options without a question unless there is also something lemon-flavored available. So when I saw chocolate peppermint bark popcorn in a magazine (“Bake It”) that my aunt gave me when she was visiting from Delaware last week, I knew this was something that I had to examine further. Recently I discovered something wonderful: Andes peppermint crunch baking chips. Somehow I had managed to completely miss the fact that these existed (a fact of which my sister was aware and apparently she was holding out on me-what the WHA?) until I saw this recipe for Kahlua Peppermint Patties on Baker’s Royale. Um, yeah. Suffice it to say that there is also a bottle of peppermint mocha Kahlua now residing in my kitchen. I had to use the leftover peppermint crunch chips from this peppermint patty project into peppermint marshmallows (which I promise to share with you soon) so that I wouldn’t scarf them all while relaxing on the couch at night. Hashtag my jeans don’t fit right now. I used to hate sweet popcorn. At least I thought I hated sweet popcorn. What I actually hated was caramel popcorn. I have never been an eater of Cracker Jacks, Fiddle Faddle, or any manner of caramel corn. Since I adore popcorn so much I have been the receiver of many popcorn tins and always lamented the fact that there seemed to be approximately 200% more caramel corn than cheese or butter popcorn (why, why, WHY?). However, when my secret pal bought me some white chocolate sea salted caramel popcorn from the Popcorn Pantry, I realized that my prejudice had been unfair. Popcorn coated in chocolate = stellar snack. And while I certainly won’t discourage you from trying out the varieties that Popcorn Pantry has to offer (and there are a lot! ), I am going to encourage you to please please try making chocolate coated popcorn yourself just once..you’ll realize that it’s totally worth sparing yourself the drive and it’s a whole lot cheaper. I didn’t use the recipe for peppermint bark popcorn from the magazine that my aunt Jeanie gave me, which came from Party Popcorn by Ashton Epps Swank, but thank you, Ashton, for inspiring this recipe. It’s truly as delicious as it looks and sounds and I think I’d like to eat the rest of the bag right now, except for that whole pesky jeans not fitting thing. 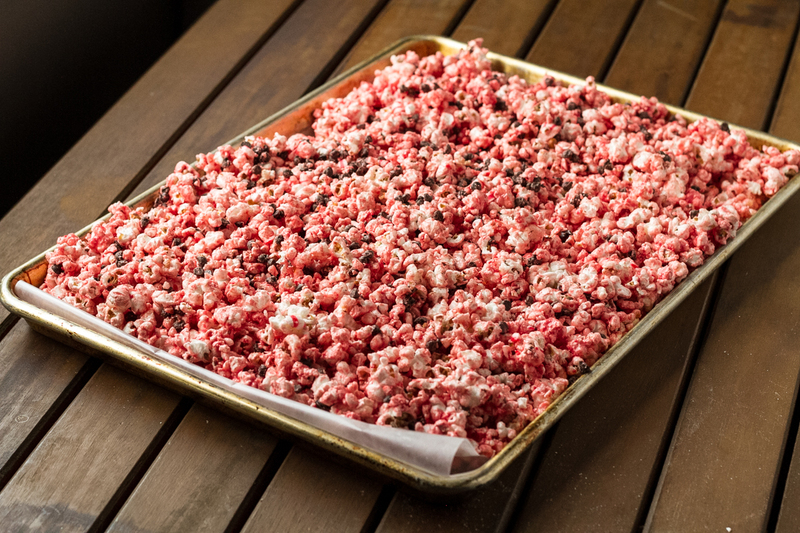 So package some of this peppermint bark popcorn up in some cute paper containers and give it away to your friends for Christmas-they’ll love you for it-and keep the rest for yourself! 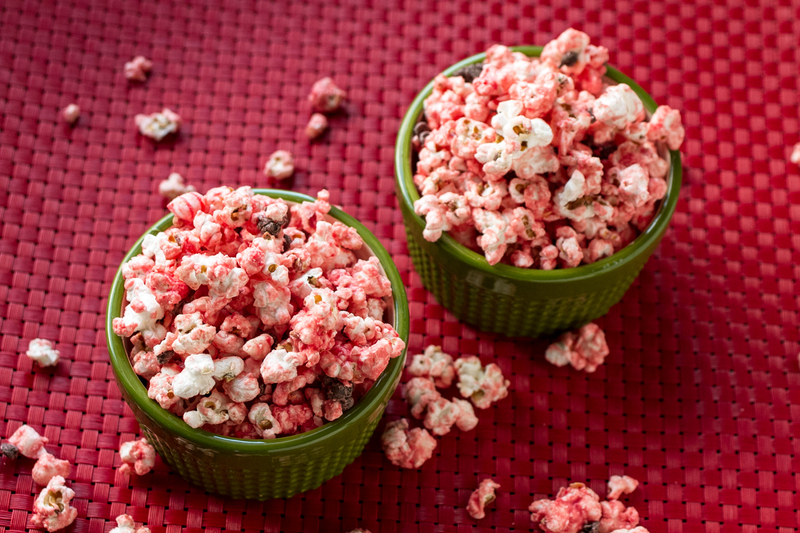 This recipe was inspired by a recipe from Party Popcorn featured in "Bake It" magazine. In a large (at least 4 quart) pot, heat the oil over medium heat until shimmering. Add the popcorn and cover. Shake the pot frequently to prevent burning. 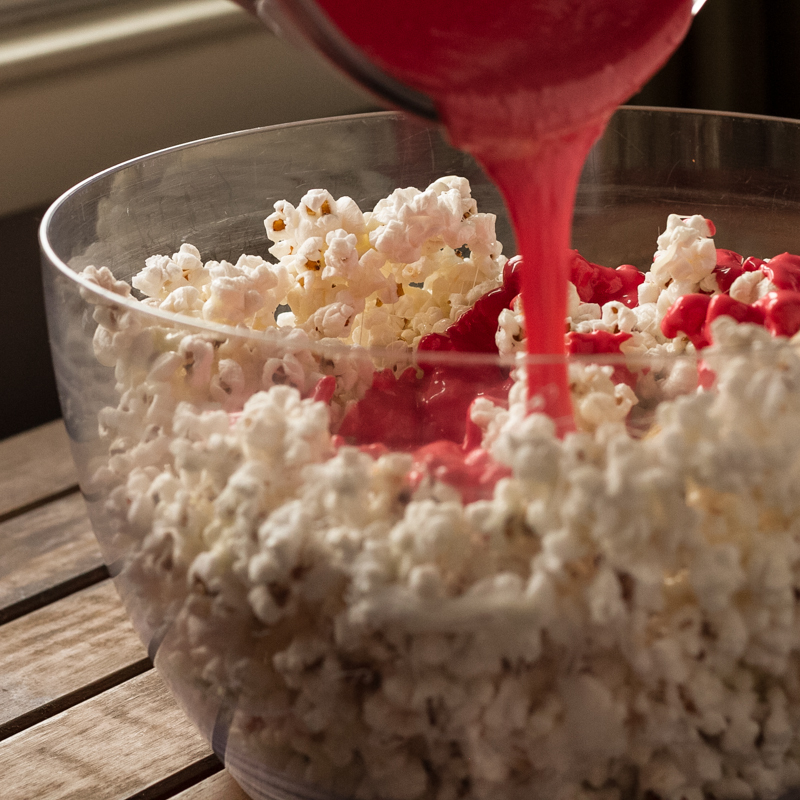 When the popping slows to a pop every few seconds, remove the popcorn from the heat and pour into a very large bowl. Melt the butter in a small saucepan over medium-high heat. Add the marshmallows and stir until they have completely melted. Pour over the popcorn and stir to coat. Pour the baking chips into a microwave-safe bowl. Microwave at 50% power for 30 second intervals, stirring after each interval, until completely melted. 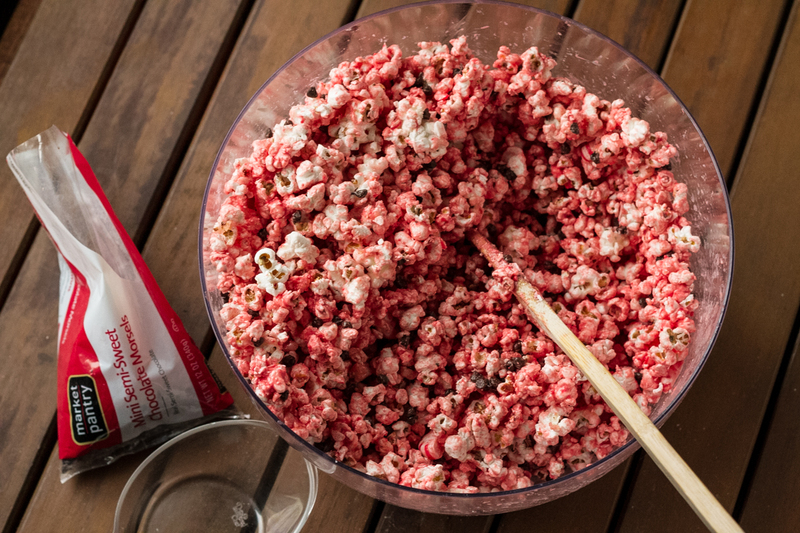 Pour over the popcorn along with the crushed peppermints and the chocolate chips. Stir to coat completely. Store in an airtight container or zipper bag or divide among cute food containers or bags to give as gifts. 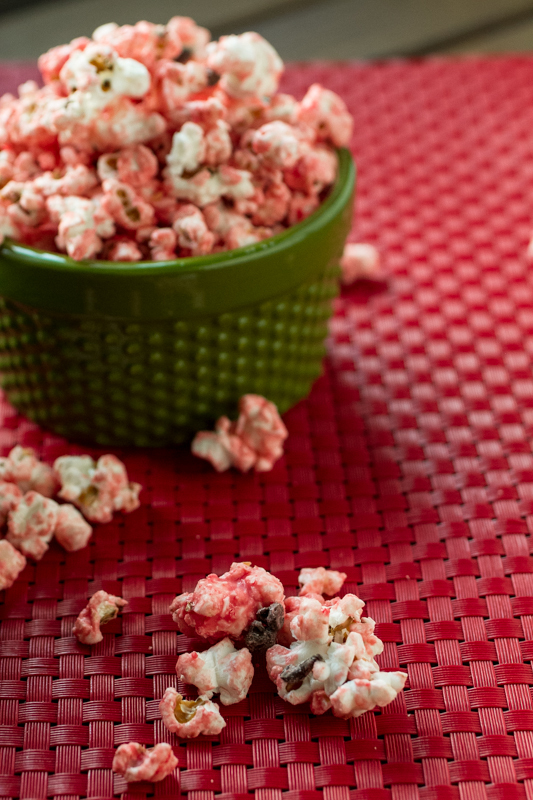 If you prefer, you can skip the popping step and use 8-10 cups of prepped (bagged) popcorn! Print the recipe for peppermint bark popcorn! 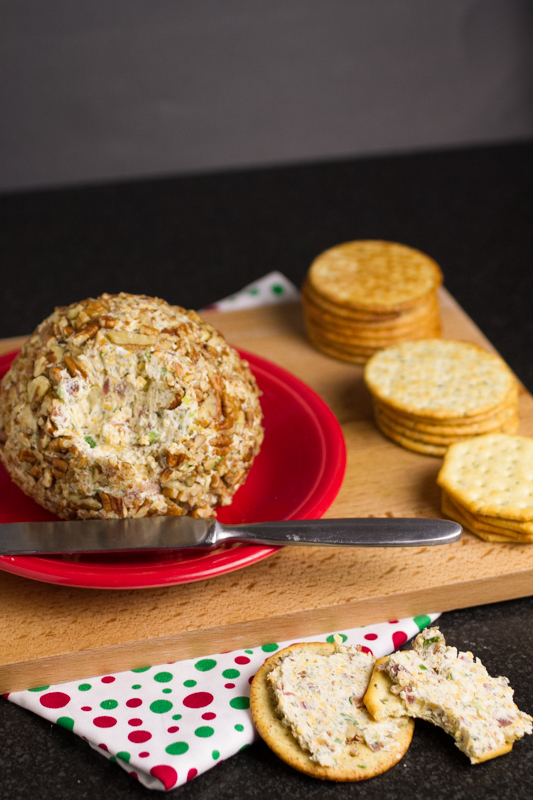 Cheddar bacon ranch cheese ball is easy and made with ingredients you probably have in your house! You can make your own ranch dressing blend or use a packet – it will be delicious either way. Cream cheese, cheddar cheese, bacon, green onions, ranch, and pecans – definitely a crowd pleaser! You’ll be asked to bring it to every party you go to! I’m so bad at parties. I’m a classic introvert; if you know my chatty side then you know me well or I am very comfortable around you for whatever reason. I do my best to avoid social interactions with people that I don’t know. Parties…parties are the seventh level of hell for me. I am incredibly awkward trying to make small talk with people I don’t know well. It’s ugly. A few years back a good friend from work and I decided that we were going to go to our staff Christmas party and be social, come hell or high water (this was a few schools back; I’m actually comfortable interacting with all the people I work with now). It was basically my worst nightmare-thank God she was there with me or I might have hidden in the coat closet. I don’t remember much about that party except that the teacher who hosted had a beautiful home and that one of the teachers brought an absolutely amazing cheese ball. It had cheddar cheese, Major Grey chutney, and bacon in it, and she brought it to every occasion and gave it as a gift every time she needed to thank someone for something. I used this opportunity as an excuse to stay near the cheese ball table and only interact with others who came near it. It worked. I need to get her recipe…searching the interwebs has yielded some similar cheese balls but nothing exact. Cheese balls are such a retro party snack, and I’ve seen them written off as too kitschy for a modern food-lover’s table. Whatever. If you don’t like cheese balls then you just haven’t had the right one. Cheese balls are great holiday appetizers – but I like to eat them as a snacky dinner, too! 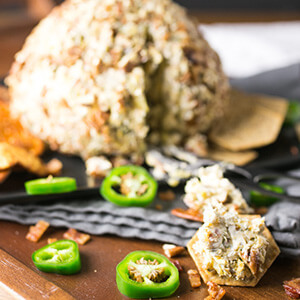 I was dreaming of a delicious cheese ball with simple, easy to find ingredients when a cheddar bacon ranch cheese ball popped into my head. It was basically perfect. For this cheddar bacon ranch cheese ball, I make my own ranch dressing mix (based on this ranch dressing mix recipe from Chef in Training) and will list the ingredients that I use in the recipe, but there is no shame in using a packet of ranch dressing mix. I’m just 1000% more likely to have all the dried herbs and spices I need than I am to have a dressing packet, and usually I have every single ingredient necessary to make this cheese ball at a moment’s notice. 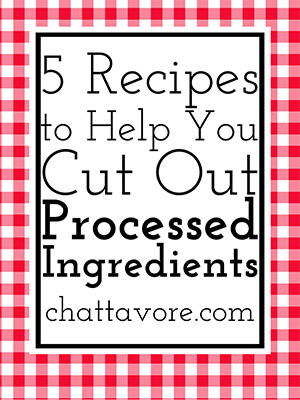 If making your own ranch dressing mix, pulse all ingredients together in a food processor. If you don't have a food processor, it's fine to just stir the ingredients together, but it will have a little more texture. Combine the first five ingredients until well mixed using an electric mixer or a wooden spoon. Form the mixture into a ball. Roll in the chopped pecans to thoroughly coat the outside. Place the cheese ball on a plate. Cover with plastic wrap and refrigerate for at least one hour. Serve with crackers or pita chips. Prep time does not include time to cook bacon or make ranch dressing mix. If you would like to make a smaller cheese ball, just half the ingredients (the cheese ball pictured here is actually a half recipe). These easy sausage balls from scratch are a classic party favorite without the need for boxed mixes! Everyone at your holiday party or potluck will love them, and they are also perfect for a Christmas breakfast treat! Your family won’t be able to get enough. Sausage, cheddar cheese, flour, baking soda, baking powder, salt, butter, and a little milk…so easy and delicious! Scroll down for video! Christmas Food is the Best Food! There are so many things to eat at Christmas. I could never pick a favorite. I mean, ranch Goldfish? My grandmother’s egg soufflé? All the cheese balls?? For Christmas dinner, we eat prime rib and twice baked potatoes. Can you see why I❤Christmas? At every Christmas gathering (including my family’s Christmas breakfast) you are likely to find sausage balls. Little nuggets of breakfast sausage, cheese, and biscuit mix (aka Bisquick), these things are addictive. They’re low-calorie too, so you can eat as many as you like (⬅that’s a total lie). Truth be told, though, I don’t wait for Christmas to make sausage balls.We love to eat them for breakfast or for an occasional Saturday night snack (Saturday night is snack night in my house). I have nothing against Bisquick. My mom makes her sausage balls with Bisquick and Cheez Whiz (because Cheez Whiz helps them to mix up more easily) and those things are goooood. I’m a biscuit purist, though, so I don’t keep Bisquick or any other type of baking mix in the house, so I’d rather just make my own than go buy a box when I want to make sausage balls. Easy Sausage Balls from Scratch! These take approximately one minute longer to make than sausage balls made with a baking mix (that minute being used, of course, to measure the ingredients) and they are every bit as delicious. So, whether you want to go the traditional route and use a baking mix or make these easy sausage balls from scratch, just make some sausage balls. It’s Christmas! They are perfect for a holiday potluck or party or for serving for Christmas breakfast. Everyone in your family will love them, and you don’t have to buy a box of mix to make them! Click here to save this recipe to your Christmas and breakfast boards on Pinterest! For more videos, click here to subscribe to my YouTube channel! Preheat the oven to 375 degrees. If desired, spray 2 sheet pans with cooking spray (I actually never bother). In a large bowl, stir together the flour, baking powder, and salt. Using a pastry blender or your fingertips, work the butter into the flour mixture until the mixture resembles coarse crumbs. Add the sausage and cheese to the bowl along with a couple of tablespoons of milk. Using your hands, work the ingredients together until well-combined, adding milk a tablespoon at a time to moisten the mixture so that you can get all the dry flour (you can also use a stand mixer with the paddle attachment to do this, but I just prefer to use my hands). Portion the sausage ball mixture into tablespoon size pieces (I use a cookie scoop to do this) and roll into balls using your palms before placing them onto the baking sheets. Bake the sausage balls until lightly browned, about 20-25 minutes. Stack on paper towels for a few minutes to absorb excess butter. Serve immediately or at room temperature. These bacon sliders are served on Hawaiian rolls with sweet and spicy pineapple-jalapeño jelly. They are perfect for tailgating, parties, or a snack dinner! You can adjust the heat level based on your preferences. I am fully aware that there is a camp of people who stand firm on their belief that the only sandwich that qualifies as a slider is a burger. And I get it. I mean, I’m from Chattanooga, birthplace of the Krystal burger. But I just feel like there’s room for everyone in the slider game. Mostly because “mini sandwich” just feels so darn clunky. It is a well-known fact that my favorite type of food is the kind of food that one would eat at a bar or at a tailgate. #spinachdip4eva (seriously, spinach dip is the reason that I basically lived at TGI Friday’s as a college student). Any type of slider included in that list of my favorite foods. Funny thing is, there are a million different kinds of sliders on the internet. I think the original party sandwiches had ham and cheese and a sweet buttery glaze. Don’t get me wrong, I love those. But I can’t seem to stop making my sliders with bacon. Because you know I.Love.Bacon. A guy came into Philip’s shop recently with dried pineapple that had been wrapped in bacon, smoked, and drizzled with jalapeño jelly. I wasn’t there, but Philip hasn’t stopped raving about it since. Now, I have a smoker and I have a bag of dried pineapple and I 100% intend to attempt to replicate this recipe. Problem is, most of you guys probably don’t have smokers, so when I was thinking about how to turn the flavors into something bloggable, bacon sliders were the thing that came to mind. I thought that jalapeño jelly might be a little much, fresh pineapple too wet, and dried pineapple too chewy. Did you even know that pineapple preserves are a thing? I have bought them a few times for various recipes and they are delicious! I like to stir a little bit into plain yogurt. For this recipe, I chopped up a fresh jalapeño and heated it with the pineapple preserves. I only used one jalapeño but you can add as many as you want based on the heat level that you prefer. What do you like on your sliders? 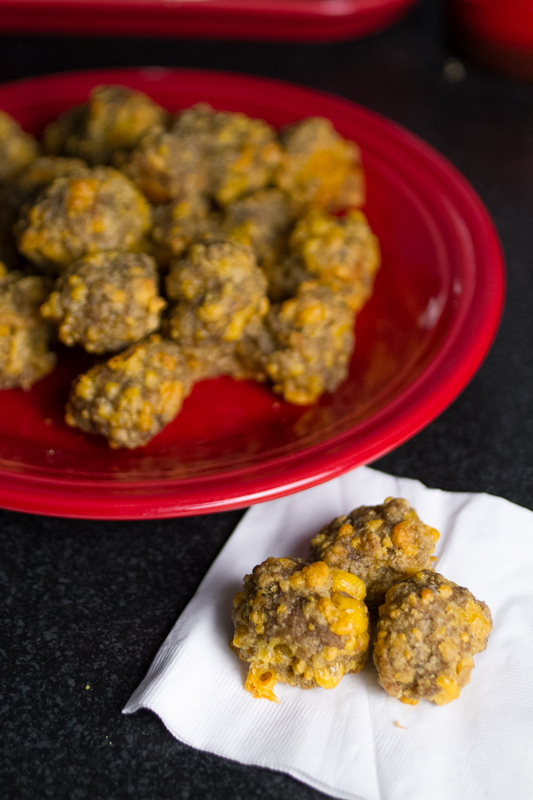 Click here to save this recipe to your Pinterest tailgating and snack boards! Remove the Hawaiian rolls from the package without separating the rolls. Use a serrated knife to slice the rolls crosswise through the center and set the tops aside. Place the bottom halves in a 9x13 baking pan. Place the pineapple preserves and the diced jalapeños in a small saucepan over medium heat. Cook, stirring constantly, for about five minutes. Set aside and allow to cool slightly. Lay the cheese slices across the bottom halves of the rolls. You will need to tear some of the slices in half. Distribute the bacon evenly over the cheese. Carefully distribute the pineapples preserves mixture over the top of the bacon. Replace the top halves of the rolls. Melt the butter and mix the honey into the butter. Brush the butter over the tops of the sandwiches. Sprinkle evenly with poppy seeds, if using. Cover with foil and bake for ten minutes. Serve immediately. The cook time does not include time to cook the bacon. Even though it logistically seems easier to spread the preserves on the bottom rolls, do not do this as it will make the bottom of the sandwiches soggy (ask me how I know).